Last February, Dana Hennelly received a text from friend and fellow Lake Oswego resident Angela Fisher, asking if she'd be interested in helping her solve a problem she was facing. Fisher was heading to Los Angeles to attend the Oscars, but an ankle injury left her in walking boot that she'd need to wear for the next 10 weeks. "She had a really nice dress, and the slit on the dress was going to show her boot," Hennelly said. Known among friends for her creativity and problem-solving ability, Hennelly came up with a design for a boot cover that would be both functional and fashionable for Fisher to wear over her walking boot. The next day, the two went to a fabric store to pick out material, and before long, Fisher had her boot cover and was on her way to L.A.
"I thought that was the end of it. When she got to the airport, she told me the ladies behind the counter were talking about her boot. She walked up and they were looking at her boot. They asked her all these questions. 'Where did you get it? Who made it? It's so cute,'" Hennelly said. For the next 10 weeks, Fisher was inundated with inquiries about her walking boot cover — out at dinner, walking through the mall, everywhere. "It was crazy, so I started doing some research on how many of these medical walking boots are sold per year and stuff like that," she said. Hennelly brought in her sister, Dawn Woolcott, and together the two found there wasn't really any product on the market that fulfilled the niche their walking boot covers did. According to the Bureau of Labor Statistics, 60,000 Americans suffer foot injuries requiring a walking boot each year. And that's just at work. "A crazy amount of people get put into a walking boot per year," Dawn said. "I've never seen anyone actually in a cover before. All I've ever seen is just the boot. Once we started Googling, we said, 'Oh, Savannah Guthrie from 'The Today Show' was in a walking boot, but she didn't have a cover. Reese Witherspoon was in a boot, but she didn't have a cover." 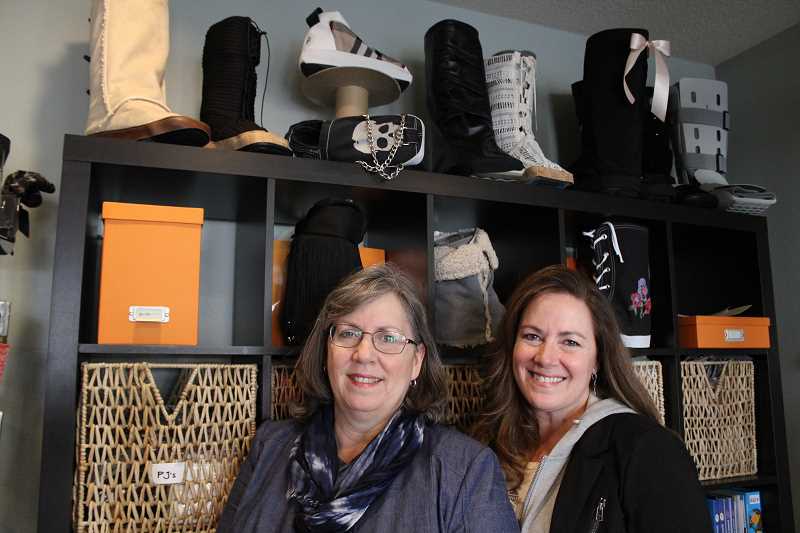 Upon connecting the dots, the sisters' new company, Flaunt Boots, was established. Launched in December 2017, Flaunt Boots aims to improve the aesthetic of the average walking boot. Hennelly and Woolcott want to bring fashion-friendly solutions to those forced by injury into those bulky and unsightly boots. The sisters grew up in Stayton, where their parents owned a fabric shop. The two remember being in fifth and seventh grade, respectively, when they worked in their parents shop and learned about different materials, patterns and designs. Flaunt Boots is not only a chance to collaborate and work closely with one another, they say, but to offer a product that's truly unique. Flaunt Boots offers several different designs, but all were created with the idea that they should potentially match what the wearer has on the other foot. "Most women have a black boot, most people have Uggs, a lot of people wear Converse Chuck Taylors," Hennelly said. "(Our designs) have evolved a lot. We had to narrow it down to six or seven, or else we'd just be designing new styles all day." Starting the business out of the basement of Hennelly's West Bay home, the two have done all their own research and development, marketing and internet sales. Most of their sales have happened by word of mouth, especially at Hennelly's tennis club — where rolled ankles are common. They did, however, receive a bit of press when they decided to send a boot cover to a television celebrity who ended up wearing it on national television. "A friend called and told me Chef Carla Hall of ABC's 'The Chew' was in a walking boot," Hennelly said. "She told us we should send her one and so we did. She wore it on the show, and she came and did a little fashion show twirl. That was really cool." Last week, Hennelly and Woolcott found out they'd been accepted by Amazon Homemade, a newer aspect of Amazon.com's repertoire aimed at competing with the handmade-focused e-commerce site Etsy.com. "If you search on Amazon, Flaunt Boots will pop up, so we're excited about that," she said. "In the future, we'd love to ramp up our online sales." Outside of searching on Amazon, you can find Flaunt Boots at flauntboots.com, where you can view the entire collection, read more about the sisters' idea and purchase boot covers. Despite a bit of a learning curve in starting an entrepreneurial endeavor, Hennelly and Woolcott are just excited to be in business together and doing work that flexes their creative muscles. "We're learning our way," Woolcott said. "It's fun to be doing something creative, and we love working together."